The Results panel displays the output from using the Identify tool, from a search using Find, or from other operations that output information. Results panel expands automatically after performing a search or after you choose the option to add features found with the Identify tool to the Results panel. You can also expand Results by clicking its down-arrow in the Console. If you open Results before doing any search or Identify, the Results panel will be blank. You can collapse the Results panel to its title bar by clicking the collapse icon. You can resize the height of Results by clicking and dragging the bottom of the Results section. If Results is re-opened, previous results will still be visible, along with any new ones just found. After doing a search or adding results from Identify, an item will be added to Results. If you do another search or add another result from Identify, the new results items are added to the top of the list in Results. Previous items remain in the list. 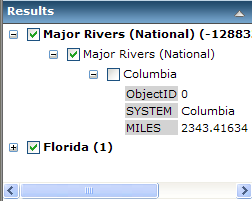 To see information associated with a Location or Find result, click the plus icon to the left of the item. When you expand a results item, you will see one or more layer names. Expand a layer to see the features found within that layer at the location. Features are listed using the value of the first string field in the attributes. To see details for a feature, click its plus icon . This displays attribute field names and values for the feature. You can hover over features in the Results, and the corresponding graphic on the map will change color temporarily. This allows you to quickly determine the location of features listed in the Results window. You can hover over a graphic for a feature on the map and the feature will temporarily change color. A label, if available, will also be temporarily displayed for the feature. You can then click on the graphic or the label and the label will expand to display all available attributes for the feature. You may scroll through the list of attributes. When you move the cursor away from the graphic, label or box, these items will be hidden. This allows you to easily explore the features highlighted on the map. Features may be selected (highlighted) on the map by clicking the check-box next to feature names: . Most tasks select features when they are added to the Results. By default the highlighting has a cyan (blue-green) outline or fill, but this may be set to a different color by the creator of the map service. To unselect features uncheck them in the Results window. You can unselect an entire layer or result set by unchecking its check-box in the Results window. You can zoom to one or more features in the Results window. See the table above for illustrations of the right-click menus. To zoom to a single feature, right-click the feature's name (next to the plus icon), and in the pop-up menu, choose Zoom to. To zoom to multiple features in a layer, click in the checkboxes of the features, then right-click on the Layer name, and choose Zoom To Selected Features.